12/08/2006 - We have ice - Finally!! All Lakes on the Flambeau chain are now ice covered but far from safe! Forcast warm temperatures will not improve the situation anytime soon. Use extreme caution when venturing out on early ice. 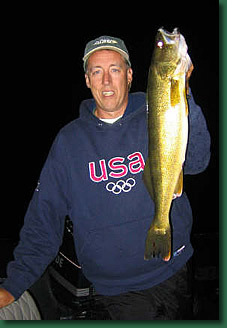 Deep shoreline weed edges and points are a good place to start at first ice for Walleye. Weedy bays are good for panfish and Northern Pike and usually have safer early ice.